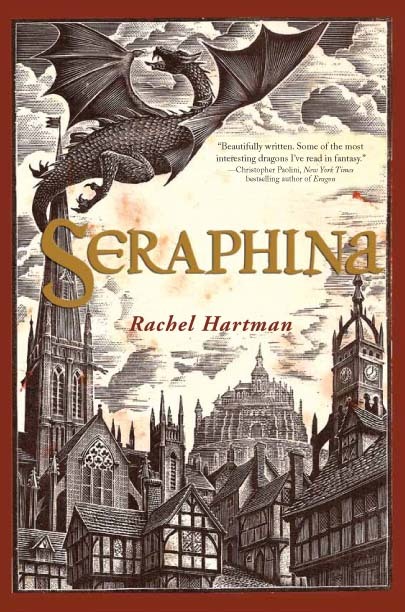 This book is about a half dragon half human girl named Seraphina Dombegh nothing else can be said. She is in a world with an uneasy alliance between dragons and humans and humans being the stronger race. I thoroughly enjoyed this book and this books goodness had been further highlighted due to the fact I read it side by side with tiger’s curse unfortunately I couldn’t finish it before it was due at the library well at the very least I managed to read a decent amount of it and I would most definitely be buying it. This book is just great, I really enjoyed the story and I would wholeheartedly reconmend it to everyone I know it was just that good. It is a high fantasy story about dragons and the dragons here are awesome with a whole new twist and species. Dragons are forced to take human forms although they still keep some distinct dragon traits such as their tail and that was pretty cool. They also have to wear the bell that identify them to be dragons in human forms. Seraphina is in the middle as she is a hybrid, she is also the music mistress I really enjoyed reading from her perspective especially the part about music it convinced me that she was a music mistress. The part about music here was great and it was believable and I for once again had some faith in reading about music from books. Music had been something rare to theme about in books and quite rare in fact. I enjoyed the parts about and the sheer amount of detail spent describing it. Seraphina learned music due to the fact that she is plagued by visions and music was to tame her mind from overloading her. Seraphina’s mind have inhabitants that was amazing and great which wad a joy to read and fresh air as well. The plot starts from the death of a Prince that was suspiciously like a dragons and at one point a dragon steps forward and says that if he wanted to kill them he would have just chose to stab through his head rather than make it look like a dragon had killed him instead make it ambiguous and that was actually nice to read about and definitely different. Thus, this book was nice to read and would definitely buy it once I have the chance and such.